In the South-East of the Département des Côtes d’Armor, the church of Notre Dame du Roncier in Rostrenen was built around 1295 on the site of the manorial castle chapel of the Barons of Rostrenen, then reshaped in the XVIIIth abd XIXth centuries. The church is introduced on the town website and on the Topic-Topos site. 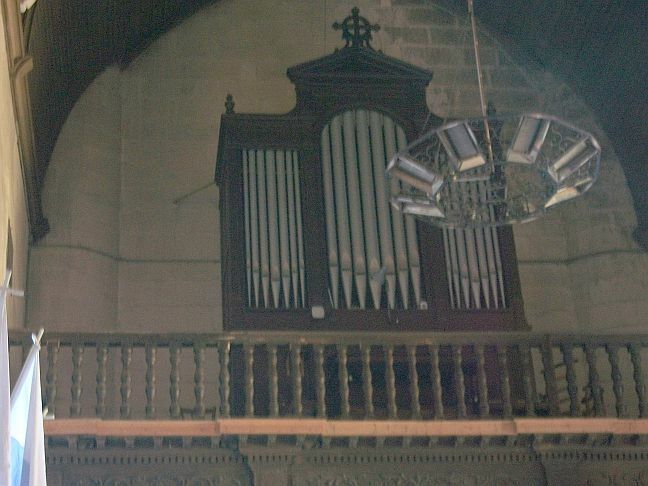 Organ built in 1890 by Louis Debierre and renovated in 1929 by Georges Gloton. (1) then transformed (in a neo-classical style) by Jean Renaud in 1976-77 ( inaugurated on April 13th 1977). (1)the renovation was financed by Mr Joseph Kerhulu, an ex-parishioner from Rostrenen then established in Canada. The case is in a neoclassical style, in red Northern pinewood. The visible pipes are factitious. The last one we know of is Reverend Rault who died in 2011.